Enjoy the wonders of spring with mom, women and the special individuals in your life and allow the McMichael’s beautiful natural environment to inspire your art-making. In this indoor/outdoor family workshop we begin with a short nature walk and outdoor art-making session, using oil pastels to capture the sights and colours of the season. 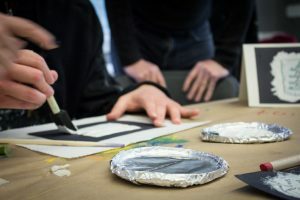 The studio continues indoors, where participants will create several art pieces utilizing a variety of materials. Students will create sculptures, nature impressions with colourful air-dry clay, a sgraffito/scratch painting and 3D wool flower creations. Registration required. Free. For gallery admission, 2-for-1 passes are available upon request. Please register below. 6 out of 13 available	 General	 General ticket, valid for program registration for the entire family/caregivers.